This guide, along with a 12 volt test light and a few jumper wires, should get you to the bottom of most problems with the 65/66 sequential turn signal and brake light system. 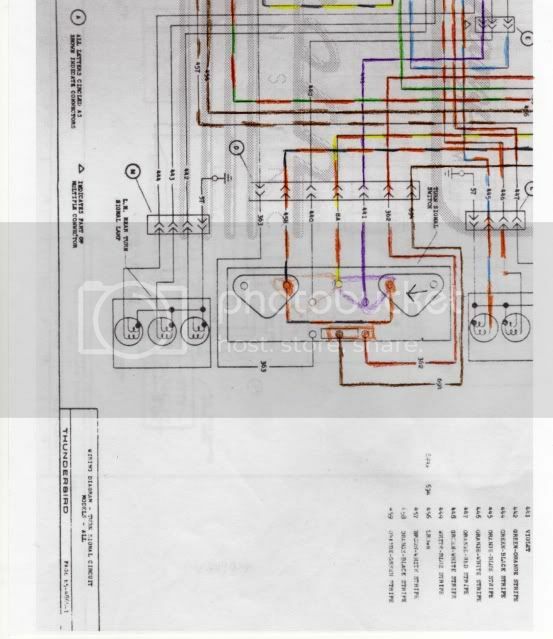 One problem that pops up from time-to-time is inaccurate info printed in the schematics that are reproduced and sold by parts vendors. Incorrect wire numbers or colors are not uncommon; the most correct I've found are from Jim Osborn. 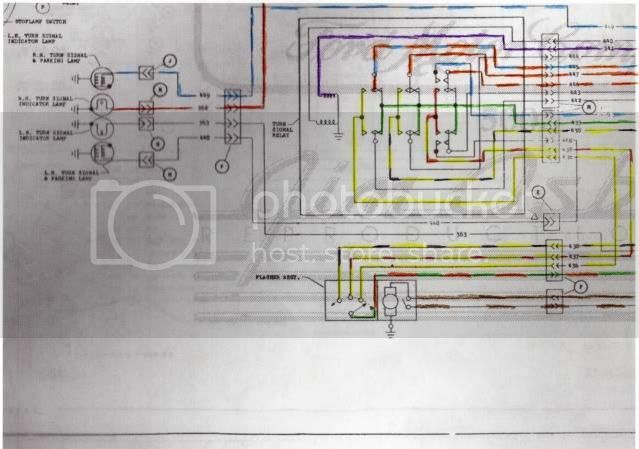 Also most schematics don't show the stop light relay, they show the wire leaving the stop switch and going directly into the turn signal relay. Finding a break in a wire can be tough, but should be done instead of just going around it with a new wire as the old one may still cause a short. All the wiring for the rear of the car starts under the console and continues under the rear seat. I like using a test light instead of a digital volt meter because they actually draw a little current, where the meter doesn't. Jumper wires are used to either go around a bad part for testing, or bridging a connector that has to be unplugged for access. An example would be where a brake light switch is bad - a jumper wire can be used to connect the two switch wires so the rest of the system can be tested. Another example is where a stop light relay is bad. By unplugging the relay and using a jumper wire from the key hot to the green output wire, the system can be tested and parts can be ordered all at once. Please note the names of the two different relays, and their location, don't let yourself get confused.. Also #'s 3, 4, and 5 are in an insulated 'bag' wrapped in tape and held in by 2 bolts. A process of elimination is the best way to find the problem with the system, unless you know right where to check, start from the beginning, it's faster. After working on several of these systems what can't be stressed enough is to check the fuses and breakers for current before diving in. If those test OK check for key on or ACC power at one wire of the stop switch on the brake pedal, the orange/yellow wire at the turn signal switch connector, the brown/white wire at the sequencer, and the brown/white wire at the stop light relay. If these aren't hot with the key on, find the problem and repair it before going further. The turn relay has two molded plugs, one with eight wires and one with six wires. It's actually 2 relays or coils, in one enclosure. It's basic purpose is to control current flow for the stop lights and the turn lights. The relay has 17 terminals, but not all have wires. Some are connected to jumpers for the internal points. In its normal position, all 6 rear lights are connected together with the stop light input wire #13 green. If a left turn is selected by the turn signal switch, current is directed to the #7 white wire, or if a right turn is selected current flows through the #8 violet wire. When a turn is selected the turn signal relay disconnects the brake light point from the selected side (right or left) and instead makes a connection with the wires from the sequencer by way of the magnetic coils inside. This flasher needs to be lubed, it's very noisy. When the power is removed from the brown wire the cam stops. Putting power on the brown/white parks the cam to the beginning position. The sequencer is a motor/gearbox that drives a 4 lobed cam at fairly slow speed. The cam closes a series of 3 points that direct current from the turn indicator relay into the turn relay where it gets directed left or right. The fourth point is used to park the sequencer when the turn is cancelled but the sequence hasn't been completed. The point closest to the gearbox is the parking point. The stop light relay is just that, a relay to allow the small contacts in the brake switch to control enough current to supply 6 stop lamps. The relay connector is different in shape from 65 to 66 but does the same job. When the brake pedal is pushed the stop switch sends current to the stop relay, and the contacts close. This allows power from the circuit breaker in the fuse box to flow through the relay and into the turn signal relay where it makes it's way to any stop lights that are connected through the points. Every time the points open the indicator light on the fender blinks. The turn signal indicator relay is bolted to the left side of the steering column support, next to the seat belt relay. Current enters from one wire but flows out of two wires on separate paths. One is through a set of points that connect power from the turn signal switch to the indicator lamps on the fender(s). The other is through a winding in the relay, then to the sequencer to power all 4 turn lamps. When all 4 turn lamps are lit (3 rear and 1 front), there is enough current flow to pull the moveable arm and open the points, making the indicator lamp blink. Soon after, the sequencer turns off all lamps, the relay point close again and the cycle starts all over. Low voltage or a burned out lamp will keep the relay from opening the points, and the indicator lamp won't blink. Testing the turn lights: A few things have to happen for the turn lights to 'sequence' properly, so let's follow the flow. With the key on current comes from the breaker to the orange/yellow wire of the turn signal switch. When a turn is selected the current is directed into four paths, one goes to the turn indicator relay, the second is coming back from it, the third is the white or violet wire that selects right or left at the turn relay, and the fourth #456 brown turns on the sequencer motor to spin the cam. The first path is as follows: From the turn signal switch wire # 458 orange/black to the indicator relay, through it's winding, then out on wire #459 orange/green to the sequencer points board where current is directed by the points when closed by the rotating cam (they are normally open). From the sequencer current enters the turn relay where it's directed by way of the points or contacts that are pulled together by the left or right coil inside. The second path is the same current that was supplied to the indicator relay, is branched off internally through a set of points (normally closed) and back to the turn signal switch where it's directed to the right or left indicator lamp on the fender(s). If a lamp is dim on both sides, say the inside lights for example, this indicates a dirty point in the sequencer. I avoid sand paper to clean the points, a cheap metal finger nail file works well and won't ruin the point. The front turn lights are internally connected in the turn relay to the center-rear light. These can all be checked at the turn relay with a test light. The sequencer also has a brown/white wire that is key hot, it's purpose is to supply current to park the sequencer motor if the turn is cancelled in the middle of the sequence. If the turn lights don't complete the sequence and stop immediately when the turn signal switch is centered, check for current on the #457 brown/white wire. If OK check the point closest to the motor in the sequencer. Testing the indicator lights: The indicator lights are a common problem for two reasons, they don't light at all or they won't blink. The flow is as follows...from the turn signal switch through the points of the turn indicator relay, back into the turn signal switch and directed to the proper lamp on the fender. Using a test light, the wires can be found under the hood and unplugged for probing. If current is found, the light should be opened up by unscrewing the ring that holds in the lens, then checking the bulb. These are single wire lights meaning they are grounded by the light base to the fender. Corrosion is a common problem in the socket as well as with grounding. For lamps that light but won't blink, the first thing to check is that all 4 turn lamps are lit (3 rear and 1 front). The indicator relay uses the current from all 4 lamps to open the points and momentarily blink the light. Dirty connections at the breaker, or a low engine idle can stop the lights from blinking. The relay can be opened and the point arm 'adjusted' a little to help blink the lights easier. Some owners just wire the indicator light in with the front turn light and call it good. To add a little info for anyone that needs to adjust the turn indicator relay, here's another picture. Using a set of pliers, bend the post so the points open, then back to where they just make contact. This gets the point arm as close to the coil as possible with the points still closed.